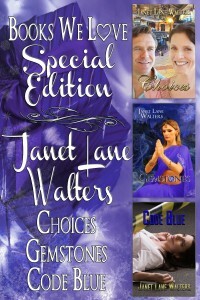 This Janet Lane Walters Holiday Trilogy published by Books We Love features three novels, Choices, Gemstones and Code Blue. Johanna Gordon, the Director of Nursing at Hudson Community hospital has never worked elsewhere. The hospital is her home. The CEO has plans and she suspects those plans will ruin the hospital and cause trouble with the nurses’ union. While delving into the problems, she is faced with other choices. Her social life suddenly expands with the arrival of an old love and the appearance of a new one. Her problems are now twofold. Can she save the hospital and can she choose the right man to bring happiness into her life? When Nicola Gordon and her younger sisters travel from India to England, she goes to a marriage she doesn’t want. Drew Barlow has no desire for marriage, but his distant cousin and Nicola’s grandfather, ran the estates into debt. Drew agrees to the marriage for the money and to please the Dowager, Nicola’s grandmother, but he has no trust for women or for love. When the two meet they clash and come together, igniting a blazing attraction they cannot resist.